For every torn ligament, twisted ankle, broken bone and knotted muscle a student athlete suffers, an athletic training student is there ready to help. Each fall, 15 students are selected to join the athletic training program. To join, potential students normally start off as exercise science majors to complete the prerequisites needed and apply for consideration. Normally their freshman year is used to gain prerequisites, they apply in the fall of their sophomore year, and then they start the spring of their sophomore year. During the first semester of the program, students mainly observe the other athletic training students and athletes, then start working directly with the athletes their junior year in five-week rotations with three sports. Seniors will only work with one sport for their final year in the program. To stay in the program, students have to keep a certain GPA and work clinical hours. These hours are obtained through working with SUU athletics, local high school athletics and other opportunities that are made available to the students. Rylie Miller, a junior athletic training major from Las Vegas, is one of those students helping the Thunderbird athletes perform at their best. In high school Miller took an anatomy and physiology class and found that she had a knack for the subject. Her teacher thought similarly and recommended SUU’s athletic training program since he received his masters in sports medicine here. “I was [thinking] well, I love sports, I love the atmosphere of sports and how inspirational and motivational being around athletes and teams and all that stuff [is],” Miller said of her decision to come to SUU and apply for the athletic training program. Since being accepted into the program last fall, Miller has worked with the SUU football team for spring ball, been a sports medicine roadie during the Aids Lifecycle in California, travelled to Oregon with the SUU football team, set up a medic table during the Cedar City half marathon and is now working with high school football players. While they do see blood and broken bones and can administer emergency care, Miller said they mostly assist with rehabilitation with previous injuries. They also prepare waters, do taping, help ice muscles and conduct electrical stimulation of muscles. Not only do the athletic training students help the athletes physically, but emotionally as well. Miller’s pass for the Sept. 2 SUU football game against Oregon. Courtesy of Rylie Miller. When meeting athletic students from other schools, Miller shared that they were shocked that SUU students get to actually work with the athletes, so she’s thankful for that aspect as well. “That’s something that’s different and unique and perfect about this program,” Miller said. Being in the program isn’t just a one way street though. Miller expressed she is constantly inspired and motivated by the athletes she works with. “That’s one thing that I love about being around sports is that they just motivate me to be better and just do better and push myself because life is too short to not experience everything you can,” Miller said. Miller and Adam Hollien, a junior athletic training major from Tooele, at their medic stand for the Cedar City Half Marathon. Courtesy of Rylie Miller. More than any of the other amazing experiences she’s had, Miller said that once during a cold spring practice she had an epiphany about how happy she was in the program. “It started snowing, and it was coming down, but I was sitting there and I was like, ‘I am so happy right now. How am I so happy?’ It is snowing outside, I am out here freezing cold with water bottles, and I was like, ‘this is exactly what I wanted,’” Miller said. Athletic training students can work anywhere athletes are found after graduating, but Miller’s goal is to go to the very top. “[For me] personally, the dream would be to work at the Olympic Training Center because that’s the most elite athletes, that’s top-tier,” Miller said. After going the distance Miller said she would like to return to college level sports once she’s ready to settle down. 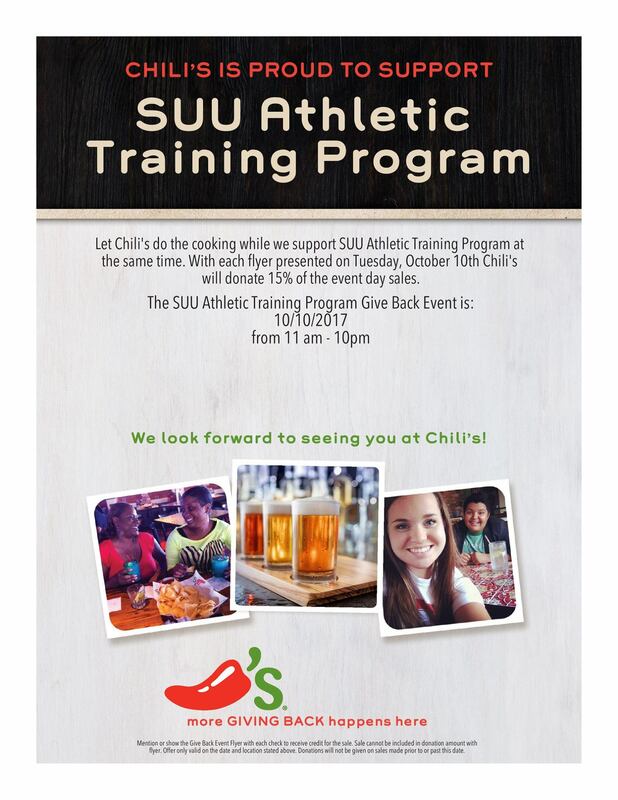 If you would like to support Miller and other students in the athletic training program you can dine at Chili’s during their fundraiser on Oct. 10 from 11 a.m. to 10 p.m. and by showing your server the flyer found here. Correction: In the September print edition of the University Journal Miller’s first name was mistakenly spelled as “Riley” in the headline. Our apologies to Miller.